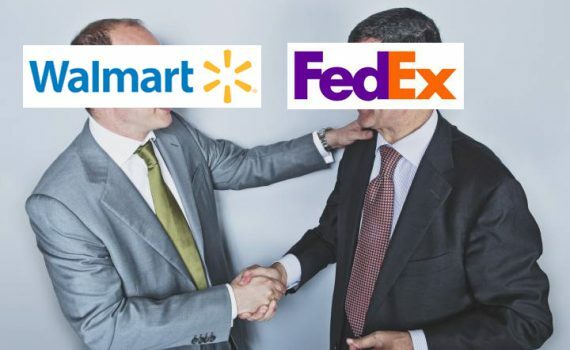 Recently, news outlets have been spouting out how Walmart is positioning itself to take on the beast that is Amazon by strengthening their partnership with world renowned shipping brand, FedEx. This news coming off of the sad release of TRU’s announcement was seemingly put into affect to comfort those shopping consumers that of the the major players is looking to foster more convenience that casual buyers are always looking for. Sadly, this type of partnership is too little too late. The article goes on to discuss the other benefits told to them by the partnering companies including local pickup convenience and possible temporary storage space usage… which I don’t think there’s a serious demand for. I could be wrong, but I definitely have strong doubts. Of course, nobody really addressed the elephant in the room… how is this actually going to lend advantage to FedEx or Walmart against Amazon? Amazon outclasses Walmart in every wholesome sense in product and service, and Amazon’s also started to take point on its own logistics leaving both of these legacy businesses wish they were somewhere else. In addition, Amazon’s actually got Walmart beat on inventory as well since a Walmart can only carry some much stuff in its own stores regardless the size, and its always got to manage turnover or pay the price. With Amazon, you get everything that’s offered in Walmart PLUS the rest of the world as 3rd party sellers are Amazon’s decentralized buyers, suppliers, shippers, and marketing team to say the least. And in a more genius move, Amazon offers the FBA for 3rd party sellers where independent retailers pay Amazon to hold their inventory for them. Can Walmart get any product partner to pay for warehouse storage? Not likely ever. Amazon still wins. As far as FedEx, Amazon’s already making tremendous strides in delivery. With Amazon doing same day delivery, local pickup lockers partnering with 7-11 convenience stores, and drone shipping experiments, FedEx should be worried as well. Amazon is poised to have its own proprietary logistics just for their service and they’re very close to sealing that deal. This has all delivery services including DHL, FedEx, UPS, and even the Post Office, in a massive scramble to fill the hole that’ll be left once Amazon takes in its own shipping business. Strangely enough, I think this FedEx/Walmart partnership will seem at face value a good idea, but it may very well simply help strengthen Amazon! If a person registers as an Amazon seller, posts on Amazon any products that are in Walmart like an exclusive Funko Pop, and actually gets a sale, that person can then go directly to the FedEx office to ship it out. Walmart and FedEx get there cuts, but so does Amazon. Crazy right? As a seller myself, I do prefer to use USPS because of the better rates for the comparable service, but the convenience of having a FedEx office right at my point of purchase might just give a little more benefit to FedEx over anyone else in this dated relationship. I might use FedEx to get something to someone if I was in an extreme rush, but I think I’ve done that perhaps twice in 20 years. This collaboration won’t be a disaster, but it won’t have any long term impact as it has no way of controlling any advantage over Amazon. With 80% of online holiday sales already under Amazon’s grip, the future of retail as a whole will more than likely follow along side leaving any competition who think brick & mortar first in the dust.